Lately I have been falling in bed, exhausted, at around 11:00 and then I awaken several times a week between 3 and 5. My mind is filled with the impossible tasks of my life the next few weeks, big issues on the hearts of my children, health issues with one close and dear and the piles of tasks that call my name. Even as Pilgrim carried a great weight on his shoulders in Pilgrim's Progress, sometimes, I pile things on my own soul that God never intended me to carry. Yet, if I don't take stock, I pile more onto my burden and begin dragging through my days, unaware what I am carrying that God wants to carry for me. It's become a tradition for me to share about a habit I have at the end of each year, taking time to declutter my soul. I take some quiet time to focus on planning my priorities, commitments and goals. I hope it will encourage you to do the same! As Anne of Green Gables says, (paraphrase) "This is a new year with no mistakes in it yet!" There is something uniquely good about January 1. It marks a new year, a new beginning, a new possibility. It also marks, for me, the reentry into simplicity. I don’t know if there is a more satisfying feeling for me during the year than when we put all of our Christmas things away, the decorations, the remnant of cookies, the clutter. Every year for the past few years, I have pondered and written about de-cluttering my soul. I hope you will be blessed by these thoughts. I am pulling away for a few days, once again, to see what needs to stay and what needs to be cut. Soon, Thomas and Sarah will be in Oxford, Joy in Scotland, the tasks of conferences, a book deadline and a book launch will be upon me- let alone, keeping on top of my family and marriage. And so I am deliciously excited to take time alone to get back to my soul. I love the celebration of life and the traditions and the fun and the beauty of special times spent with my children, husband and friends. But, there is something deeply satisfying to me about getting it all put away and getting back to normal. All of us carry so much responsibility, the normal days are burdensome enough, but holidays put on that extra load. And I know that many of you have the added burden of caring for the needs of little ones, some of you homeschool, some of you work like I do, and we have to tame our busyness to make life sustainable. Routines go by the wayside and so the clutter and demolishing of the house, slowly takes over. I am not a person gifted in handling details—too much mail, too many catalogues, too many emails, too many options, too many things. The more there is, the more I become responsible for, the more work there is to be done, and so, the more anxious I become. Same with activities. The more I commit to, the more I say yes, the more I have to drive, the more my house gets into a mess, and the more anxious I become, the more hurried we feel, and the more weary I become. When I am not at peace, nothing in our home is at peace. We can all see how too much clutter and too many piles causes us to feel overwhelmed with life. Consequently, slowly, I have learned to declutter as often as I can—throw away unnecessary stuff--especially the stuff that lingers inside. Even as we declutter our closets and drawers, so we must lighten the load we carry in our hearts or we will become overwhelmed. Today, I was out and about and came home to a decluttered home. Sarah worked her magic and straightened some of the lingering messes. I felt different about life all evening because it was all so orderly. But, I have also come to realize that my brain and heart can be the same way---cluttered with worries, responsibilities, duties, children’s future, finances, time constraints, expectations, disappointments, critical attitudes, resentment. All of these added together, can tend to create soul piles and mind clutter. If I don’t take the time to sort the piles of mind clutter, my spirit becomes a mess and my heart becomes overwhelmed and weary. It is what awakened me at 4:00 a.m. this morning-soul clutter and worry. It is another reason I like January. It gives me an opportunity to make a new plan, to simplify the mind messes and to start off a whole new year well. In the same way that throwing away stuff and clearing out closets brings me relief, even more, soul and mind cleaning and decluttering brings me rest. Every January, I resolve to deal with my soul-clutter, so that I may have strength to face each day in peace. I come to the place where I know I will find the help that I need. I come to my Father and ask Him to help me, His child, to show me how to make get rid of the junk that is unnecessary, and to help me clean out and organize my soul. God does not want me to carry and live in stress and pressure. He wants to lead me to places of stillness and peace, to restore what has been taken away. 1. Unnecessary Guilt We all fail in many ways, and will do so until we are with Jesus. Confess your failures, your sin attitudes, your bitterness, jealousy, anger to God and ask Him to take it away from you, to restore you to freedom and peace. 2. Fear Are there areas where I am trying to carry the burdens in my life that I can't solve by fretting about them or worrying about the outcome? Financial, immoral issues of a loved one, fear of the future for my children, worry about what I cannot change? God reminds us, "Fear not, for I am with you, do not anxiously look about you, for I am your God." Identifying the things that I am fearful about and giving them into His hands lifts so much weight. 3. Hurt or Bitterness from someone who has hurt me or will continue to hurt me. There are things I cannot change, people I cannot make be strong and healthy. But I can decide not to be a victim. I can change me. I can walk in peace and set boundaries, but refuse to take in their hurt. 4. Exhaustion and stress from too much in life. 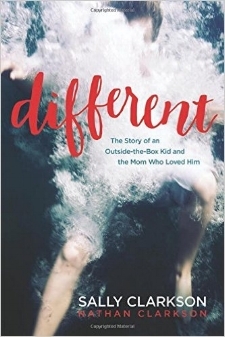 I will speak of many things in my new book, Different, and about the mysterious broken places that surround each of us. Breathing in God's peace and love every day, not trying to change or solve what cannot be changed, but trusting God that He is at work help me to walk in peace amidst the constant pressures of my day. But I have to name what drains me, ask if I have accepted the limitations of my life, been sure to extend forgiveness, to breathe in His peace. The Lord prompted, "List all of your issues, give them over to me, don’t hold on to them. I am capable of taking them from you and being responsible so that you will not be weary or carry what you are not capable of carrying. Come to Me as a child—even as your children, in their innocence and sweetness of heart, know that you will care for them and meet their needs because you are a loving parent who cares for them, so I am your Father who will take care of you. Leave the burdens to your Father and take your rightful place as a child. Humble yourself and trust Me. Enjoy me. Delight in the beautiful moments of this day. Notice the little miracles. Live as an unfettered child. Accept your little and big children and receive them as a gift from Me, and your will indeed receive Me into your midst. So, as I yielded my lists into God’s hands and de-cluttered my troubled soul, I left feeling that even as my house has been coming to order, after we cleaned and straightened it yesterday, now my soul is moving in the direction of order. Rest, rest, rest—in quietness and rest will be your strength every day, every year, until you see Me face to face. I love you, my sweet girl. Don’t forget that I am with you each moment of today. ~Your doting and loving Father. I will be hosting a book club through my podcasts for 6 Mondays about Parenting in a Different sort of way to reach the hearts of all of your children. Order Different so you can join us in this book study. It will be a an inspiration for your new year.